A couple of weeks ago I was informed about “Geekness Day” which is coming up on the 13th July. I was asked to answer some questions to prove my geek factor and to show how I embrace my geekness. I have always been a geek. When I was younger being a geek was not considered very cool, yet nowadays it appears to be something that everyone wants to be. So what makes me a geek? It all started at a very young age. My parents used to take my sister and I on holiday to the Isle of Wight, just off the south coast of England. Every night we would go for a walk along the sea front to the pier and my parents would give us £1 each to play on the machines. My sister always chose to play the penny fall machines or the slot machines. I was only ever interested in the games. Space Invaders, Pac Man, Punch Out, Out Run and my personal favourite Track and Field. 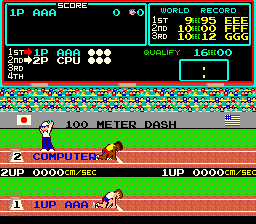 Track and Field was a game based on athletics and the idea was to compete against a computer opponent in a series of events and if you beat the opponent or beat the qualifying times you were allowed through to the next event. To play the game you repeatedly hammered two buttons as quickly as you could and the more speed and rhythm with which you hit the keys the faster you ran. Other events required you to use a third button for releasing Javelins, jumping into the sandpit or leaping hurdles. Playing computer games isn’t particularly geeky but the fact that as a child I could play Track and Field for an hour with £1 and still come back with 90 pence in change has to give me some merit points. Over the years my game playing has cost me dozens of broken joysticks, loads of money and an inordinate amount of time. When I was younger it was Jungle Hunt on the Atari 2600 and then Manic Miner, Jet Set Willy and BMX Simulator on the Sinclair Spectrum. Through my late school and college years it was Sensible Soccer, Cannon Fodder and Road Rash. I remember having a period of playing Bubble Bobble with a friend in our local club and we managed to complete 67 out of the 100 levels. There were people looking over our should as we rapidly fired out bubbles desperately evading the killer shark. At college we used to have Sensible Soccer competitions, Mortal Kombat and Street Fighter battles. I still enjoy retrogaming today and I have the Blaze Ultimate handheld gaming device for playing Megadrive/Genesys games, an OUYA and a Raspberry PI for games emulation. I was one of those kids at school that did everything in my power not to have to be outside of a lunch hour and so I enrolled in just about every kind of club there was. I joined chess club, music club and computer club. I even enrolled in a school play. 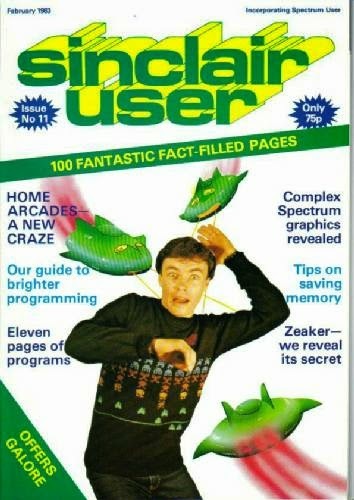 I started programming when I was 11 using the Sinclair Spectrum. Like most kids, my early programs were written in BASIC by copying reams of code out of magazines only to be disappointed by the fact that I could always get them working. POKE this and PEEK that. After leaving college I started work at Data Sciences which was later bought by IBM. I worked as a software developer in London working on large financial systems and then I joined Systems Union working on one of the largest accountancy packages. I have worked as a software developer, SQL Server DBA, SQL Server developer, software tester, applications support consultant and configuration analyst. I am currently developing an allocation management system for a large oil company in the UK. I have programmed in COBOL, C++, Visual Basic, PERL, PHP, ASP and nowadays .NET. I first tried using Linux in the early 2000s and I was delighted when I managed to get Mandrake working with full internet access, a working printer and scanner. Mandrake still didn’t satisfy all my requirements and the world was still at the stage where websites were made for Internet Explorer and everything else was an afterthought. A couple of years later I tried openSUSE for the first time and it was just what I was looking for. It was at this point that I decided to go full time with Linux at home and I have never really looked back. I have now tried dozens of Linux distributions on multiple platforms including netbooks, laptops, Chromebooks and MacBooks. Absolutely none of the above is what makes me a real geek though. What I think makes me a geek is the fact that for every problem I try and think of a way of programming a solution to it. For instance imagine I have a folder with 100 files and I need to change 1 line in each file but there is no particular rule as to which line that is. Any normal person would open each file one by one and edit the one line, save and move to the next one. The task probably wouldn’t take more than an hour or so. My mind doesn’t work like that. I can’t think of anything more tedious that editing 100 files. I therefore have to find the programming solution. The programming solution might take 5 times as long to produce but it means I didn’t have to edit those files by hand. Worse than that though, after running the program and achieving the original intended aim I will then edit the program and refactor it again and again until it is as optimised as it can possibly be. The pointless thing is that the program will probably never be required ever again. Now that is what makes me a geek. What is your proudest geek moment? A difficult question this one. I remember feeling pretty chuffed when I posted my article about finding my lost cat using my Raspberry PI. The Raspberry PI developers liked the article and sent me a camera board to go with my Raspberry PI. As a blogger it was great when I reached 1,000,000 page views and then 2,000,000 and now over 5,000,000. It was also pretty cool when I was asked to be a guest on the Everyday Linux podcast. From a programming point of view I remember being called to a customer site in Edinburgh where a client had a report that was taking 36 hours to run. I optimised the queries and the report ended up running in less than 2 minutes. From a gaming point of view there is no prouder moment than when you win the league for the first time on Championship Manager. What is your geek motto/favourite geek quote? I don’t have mottos as such but I do have a couple of theories. All applications start as spreadsheets. Generally the office expert creates a spreadsheet and they add macros and VBA code to the spreadsheet. That person generally leaves the company and the next person in line looks at the spreadsheet and asks the question “which muppet produced this?” and their solution is to turn it into a Microsoft Access database. The Access database works for a little while but then somebody else suggests writing a dedicated application with a SQL Server database used for storing the data. Once the application is written somebody says “This is all well and good but it would be better if we could export the data to Excel”. My day job is all about developing software that tells the Oil company that I work for how much oil and gas is being produced. Give me any other reason to write code and I will take it and I am not the only one. Programmers are always looking at their colleague’s projects and issues because the thing they are developing always looks more interesting. I know of one contract developer that wrote a program that calculated how much time he spent in the bathroom at work during the course of the year so that he could show the company how much it costs them. I guess everyone wishes they were the person that came up with Facebook and so Mark Zuckerberg is an obvious choice. From a Linux perspective I like the stuff that Jim Lynch writes and I love the Linux Outlaws and Ubuntu UK Podcasts. In the UK we have a television program called The Gadget Show and I doubt there are many true geeks that wouldn’t want to be in the same shoes as Jason Bradbury or Jon Bentley. Finally there is a guy called Larry Bundy Junior also known as Guru Larry who used to run a show about retro gaming on British television. I loved that show. 5. Which SingleHopper geek do you most relate to? I had to read a fair few SingleHop blog posts to work this one out but I reckon that Dennis Guzman would be the blogger I relate to most because of his affiliation to retro gaming. Of course though some people will see a striking resemblance between me and Adrienne Wicklund. 6. How familiar are you with Singlehop’s product offerings? I am not particularly knowledgeable about Singlehop in particular but I am aware of the sort of products on offer such as cloud hosting. Unfortunately it isn’t the sort of service I have had much of a need for. Well I have added what makes me a geek. It is now up to everyone else to tell me what makes them a geek. Use the comments below or use the hashtags #everydaylinuxusergeeks and #singlehopgeeks.